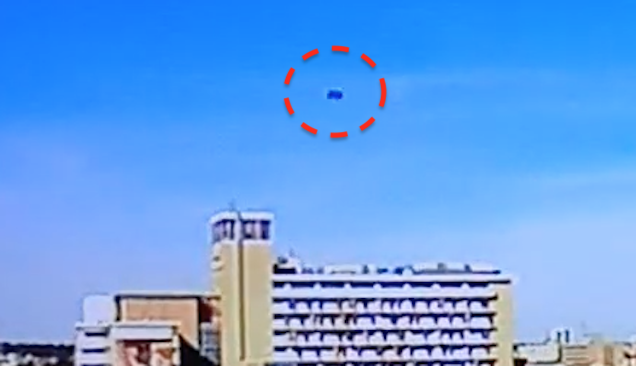 Опубликовано 09.12.2018 пользователем July N.
A news caster was talking when a UFO shot past and off into the distance. A few things about this sighting makes me 100% convinced that this is an alien craft. 1. Its shape, unlike anything known to fly today. 3. When its further away by 50 meters its color turns white. When I was filming on my roof a few years ago, using meditation to call orbs as I have seen done on Youtube many times, I was surprised by a UFO that was baseball shape and pearlescent sphere so much it was mesmerising...just 2.5 meters from me. When I realised what I was looking at I flipped around my camera on tripod 180 degrees and that little bugger was already 50 meters away when I did get video, all I got on video was a white speck in the blue sky. The color had changed to white for some unknown reason. Thats why I know this is a real sighting. На панораме города Сан-Антонио, во время выпуска новостей, был замечен НЛО. По движению машин можно понять, что запись видео идет с малой частотой кадров (один снимок в секунду или около того). Можно предположить, что на кадрах с НЛО, пролетающая мимо птица. Разрешение видео также усложняет задачу с идентификацией.